Nonprofit Board/Staff Relationships: An Uncomfortable Partnership? I have always been of the opinion that nonprofit directors don’t give sufficient consideration to the relationships between the board and staff. The following passage reasserts the complexity of such relationships and why misunderstandings might occur on either side of the fence. • Do the directors have a robust understanding of our mission? How competent is the board to judge our work? Are directors appointed on the basis of professional competency or political advantage? How well is the board recognized among our peers in the nonprofit environment? • How well does the board understand the challenges we face daily? • When a new CEO is about to be engaged, will staff concerns be considered? 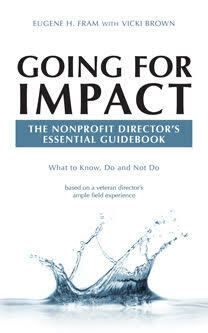 • Nonprofit boards have more frequent director turnover than other types of boards. How secure is my position? • In growing nonprofit organizations, will board mandated changes cause us to lose staff collegiality and/or interfere with the organization’s sense of caring? • Respect and celebrate staff accomplishments, both individually and as a group. • Meet with staff in small groups and on appropriate problem solving committee assignments. • Develop interest and understanding of the work they do, the challenges the group may face. Encourage staff to provide BRIEF informational updates and/or reports at board meetings or online. On occasion, ask to attend their professional conferences. • As much as possible, try to develop a collegial, not authoritarian, relationship with staff. They are well aware that the board has final authority. • As suggested by Sarbanes-Oxley, establish a board procedure that encourages directors, on occasion, to interact with key staff persons below the management level. Do your staff and board work together in harmony or in an uncomfortable or mistrusting manner? Take a moment to assess and, if necessary, take time to tune up the partnership. Your nonprofit will be the beneficiary! *Ellen Cunniffe (2013)“When a Board Seat Becomes Uncomfortable,” NPQ Quarterly, July 22nd. Thanks for letting me know. You may be interested in these links. I agree that the board should respect and find ways to work with the staff of a non-profit and lower the wall between them…the more the wall is lowered and they treat each other as equals working on a joint cause they all are passionate about…the better. Check out something i recently wrote that proposes the first great relationship that needs to be focused on is the CEO and Board Chair. Thanks for sending. I noted this blog-post several weeks ago. I have a blog-post being circulated later today that looks at the issue from another perspective. Hope you will add you comments on it.